Little Women is based on the Luisa May Alcott novel of same name. Set in Concord, Massachusetts during the American Civil War, the story follows the lives of the four March sisters as they navigate romance, their modest lifestyle, illness, and the growing pains of young women during their time period. Closely based on her own family, Alcott’s story seems quaint and melodramatic by today’s standards, and this Masterpiece version from BBC, which oddly enough was shot in Ireland standing in for Concord, MA., hardly does much to bring more depth to the story. 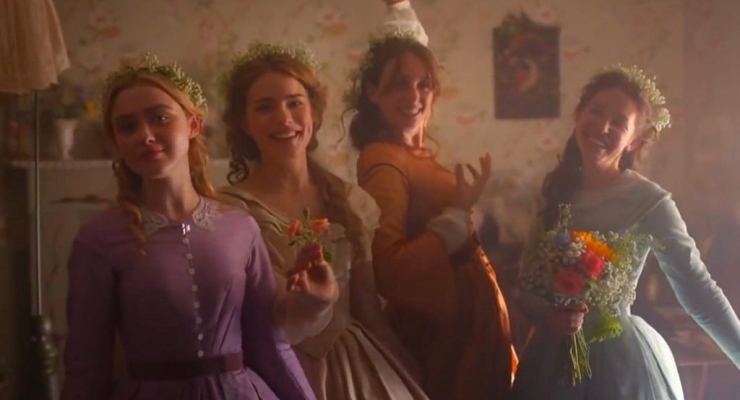 The characters of the sisters, with Jo March (Maya Hawke) may not have been the best cast, Ms. Hawke overpowering the others with her performance, but still not outdoing others who have played the march sisters in the past, most notably Winona Ryder in the role of Jo in the 1994 theatrical film. This three-part mini-series reaches its heights in its final episode, where the sisters finally grow up, face tragedy, find true love, and their stories are brought to their conclusions. There is still a sense that many of them haven’t really grown much, especially the youngest of the sisters, Amy, whose portrayal by Kathryn Newton is too bratty and forced even as she has supposedly matured. 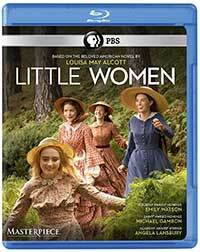 The digital production for Little Women arrives on Blu-ray in an AVC 1080p encodement from PBS. Colors and detail are strong and there’s good shadow detail, but there is some visible noise and banding in the darker areas and areas like the skies. Little Women gets a straightforward DTS-HD Master Audio 2.0 stereo mix with little dynamics and narrow stereo imaging. Dialogue is clear and the score comes through well enough. This adaptation is an uneven, yet still entertaining version of this Luisa My Alcott classic. While there have been superior adaptations of Alcott’s novel that surely outdo this mini-series, this one will be interesting for its veteran cast members Emily Watson, Michael Gambon, Dylan Baker, and Angela Lansbury. In the latest adaptation of Luisa May Alcott's novel, the four March sisters deal with romance, illness, and growing pains in Concord, Massachusetts during the American Civil War. The mini-series is uneven, but worth seeing particularly for the veteran members of the cast.